As a track is successfully copied, TouchCopy will mark the track on your iPod as copied. Whenever you connect your iPod to TouchCopy - TouchCopy will detect the music you have previously and successfully copied. This allows you to know which tracks have been copied and which have not. Tracks will be marked with a icon under either "Copied" (you have copied the track), or "iTunes" (the track is already in iTunes). 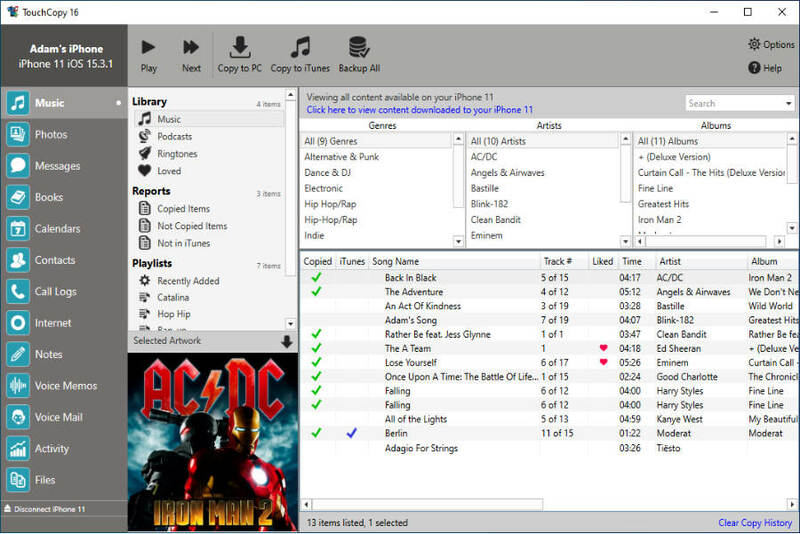 Note that if you previously copied your iPod to your computer hard drive with TouchCopy and now you wish to copy your iPod to iTunes (or the other way around) you should clear the history of copied tracks, as TouchCopy does not differentiate between history of copying to PC or iTunes. If you would like to overwrite a file of the same name, you can do this by checking "Copy and Replace existing files of the same name". You can change this setting at any time using TouchCopy Options. If for some reason you need to copy your iPod again and your selection contains tracks that have previously been copied, TouchCopy enables you to skip tracks already copied or recopy them. You can clear the history of successfully copied tracks in TouchCopy by clicking on the "Clear History" button on the TouchCopy Music toolbar.